Good evening, space fans! Here's what was up on the ISS this week. Space problems: getting photobombed by the moon. Wednesday's launch of the Japanese resupply vehicle Kounotori will bring the craft into contact with the ISS tomorrow morning. A lovely liftoff from Japan. Astronauts Kjell Lindgren and Kimiya Yui practiced using the Canadarm-2, the ISS's external grappling "arm" that will hug the Kounotori spacecraft to the station. 9,500 pounds of research supplies, food, and other amenities are aboard. The CALET, an electron telescope that searches for dark matter, is aboard, as well as several experiments integral to the once-in-two-lifetimes Twins Study. The station's cosmonauts were also busy this week, working on various experiments including research on how magnetism and human digestion are affected in space. 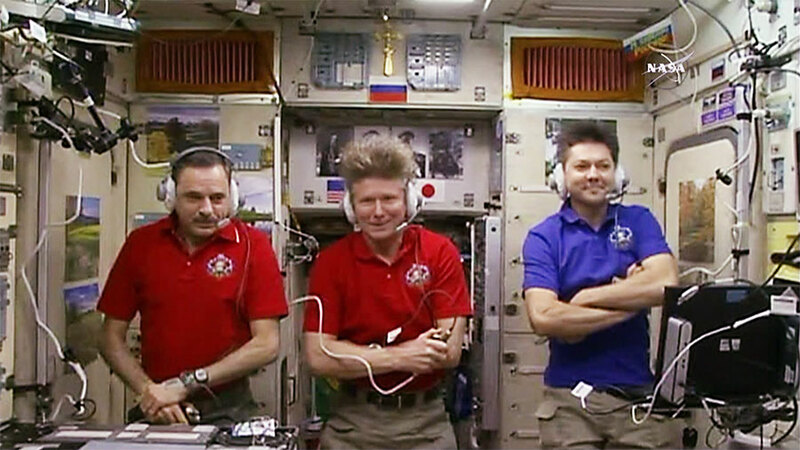 Commander Gennady Padalka, cosmonaut Mikhail Kornienko and Oleg Kononenko also chatted via video with the Russian prime minister as well as undertaking routine blood pressure and ocular tests. Commander Padalka's blood pressure is fine, regardless of how his hair looks. Another interesting experiment currently underway aboard the ISS is the Neuromapping research. This project uses MRI and fMRI imaging to determine how astronauts' brain may change in the microgravity environment. With a notable difference in pressure being exerted on the astronauts' bodies, particularly inside their skulls, this study will shed interesting light on how exactly we can expect to stay smart and sharp while swooping through space. A wide swath of coral reefs in the Pacific. "Earth Art. Looks like Earth replicated Michelangelo's famous fresco. #YearInSpace"
That's all for this week, space fans! We'll see you soon...watch this space!